Only 2 Days Left to Comment on ATA Meal and Rest Break Petition against truckers. 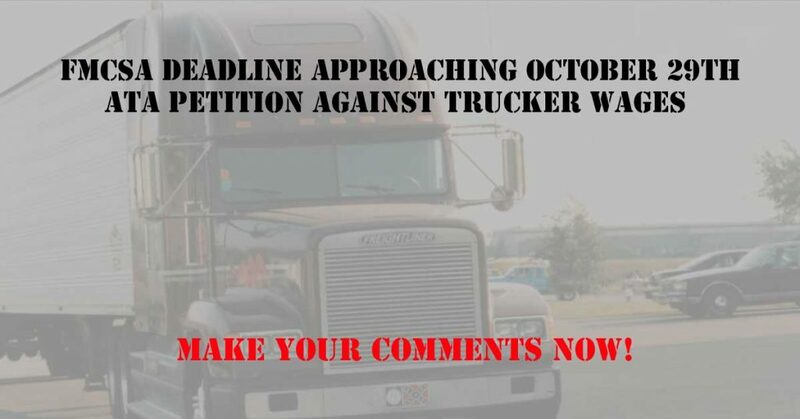 Drivers, we have been informed by TruckerNation.org that the 3 requests to extend comment period for the Petition to FMCSA from ATA addressing California Meal and Rest Break ( a smokescreen for the Denham Amendment goals against trucker wages) HAS BEEN REJECTED. The Comment Period ENDS OCTOBER 29th!! We need ALL drivers to make a comment NOW. This guide will aid you in how to comment. Many drivers are confused about what exactly the Meal and Rest Break Petition has to do with Trucker Wages. The guide will explain. The ATA Petition regarding California Meal & Rest Break Laws is a direct attack against trucker safety and wages. The ATA has muddied the waters with their Petition to FMCSA. Just the title itself “Comments to California’s Meal and Rest Break Rules; Petition for Determination of Preemption” suggests that the petition itself is specific for California drivers and only has to do with not wanting to inconvenience drivers with “meal and rest breaks”. WRONG! This Petition is about Preempting State Labor Laws which protect piece work wage employees from being exploited! Here are a few facts. Drivers do not like stopping to take breaks, and the ATA knows this. They use the “meal and rest break” as a scare tactic, implying to drivers that California is forcing them to stop every few hours. ATA also understands that drivers are trying to get as many miles as they can, so they can earn more money since truckers are paid for the miles they drive, not the number of hours they work. Trucker Wages – HUNGRY for MORE MILES- ATA and carriers relish the fact that drivers are only paid for the miles they drive. It keeps them hungry and therefore they fight for as many hours that they can get, especially since their wages have NOT significantly increased in 4 decades while the cost of living has skyrocketed in that same amount of time. ATA knows all this and wants to keep it that way. DRIVER WAGE DESIGN –California state labor laws are a threat to the driver wage design that carriers find most profitable. Keep them hungry for more miles in order to make a decent paycheck. Provide drivers with optional PAID rest breaks. Provide drivers with optional meal breaks. Pay drivers for all time worked, including non-driving tasks and all waiting time. Drivers must understand the underlying effects of how this petition ultimately affects ALL driver safety and wages, not just drivers who drive solely in California. Make no mistake, if the ATA is successful at Preempting a States’ Labor laws which protect employees from optional Meal and Rest Breaks, it would also open the door to Preempting ALL of California labor laws, including their law that requires carriers to pay drivers for all time working, including Detention Time. It would open the door to ALL states who have similar wage protection and safety laws. Based on 49 U.S.C. 31141, California Meal and Rest break law should not be preempted. According to 49 U.S.C. 31141, the Secretary shall review State laws and regulations on commercial motor vehicle safety. The Secretary shall decide whether the State law or regulation meets the criteria to be enforced or to be preempted. The American Trucking Associations, Inc. (ATA) petition to the Federal Motor Carrier Safety Administration (FMCSA) must be rejected based upon 49 U.S.C. 31141. California’s Meal and Rest break laws should not be preempted, as the Meal and Rest break laws, along with other California labor laws, were created to protect employees from wage abuse and to promote safety. These laws are compatible with present Federal Law, and do not cause any unreasonable burden on interstate commerce. The ATA falsely claims that California state labor laws will “force drivers off the road” to take their 10-minute rest breaks and 30-minute meal break. This is not true. Drivers are not forced to take these breaks. CA law does however require that Carriers provide the option for the driver to take their paid rest breaks. ATA claims that that the Federal HOS addresses truck driver fatigue better and offers more flexibility because HOS permits drivers to take breaks when needed, not when they’re told to do so. Again, this is FALSE. CA law requires carriers to provide the driver with the option to take rest breaks after 4 hours, meal breaks after 5 hours (which can be waived) but does not prevent them from taking additional breaks when they feel the need to. Truck Parking -ATA states truck parking would be greatly exacerbated if drivers take their breaks that the carriers are to provide. Again, this is false. First, CA laws have been on the books for many years, there is no indication of this or a study that has even remotely suggested that the lack of parking in CA is increased because a driver is allowed to rest if needed. 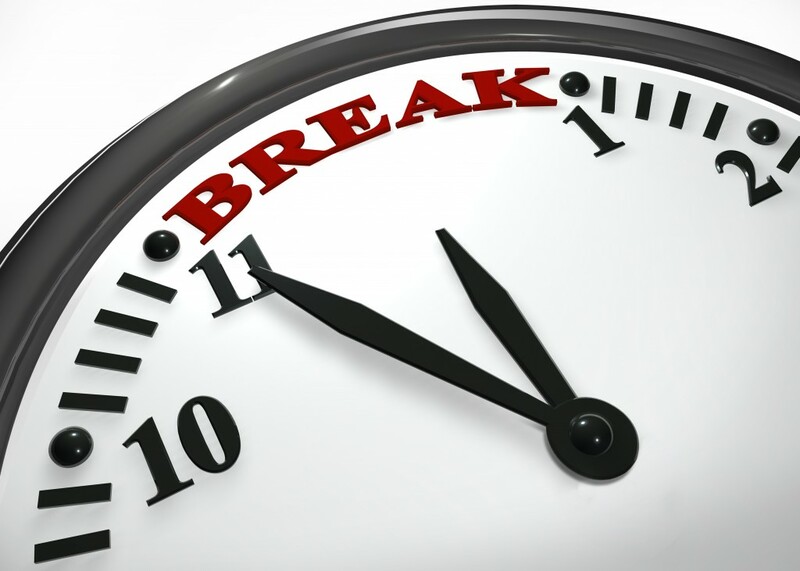 Again, drivers are not forced to take these breaks, but the carrier must provide the option. Paid for all Time – Note that CA Law also requires employers to pay employees for all time worked. This includes detention time. California Labor Code Section 226.2 – Truck drivers in California who are paid by the mile or by the load must be paid separately for time that they are not actually driving. This means that companies that pay their drivers by the piece must also pay them an hourly rate for time spent doing things like vehicle inspections and detention time. If the ATA Petition for Meal and Rest Break is granted it would open the door for preempting ALL of State labor laws, including, ”Paying drivers for all time worked”. This is something that drivers have been continuing to fight for. Driver wages have not significantly increased in decades. Drivers work many hours without pay, performing other non-driving tasks (including detention time). CA law requires that drivers be paid for all time working, including detention time. In other words, they are paid by the mile and regulated by the clock. 2) Limiting their time available to find parking as many times drivers hours run out waiting to be loaded or unloaded at the Shippers and Receivers docks. If they do run out of hours at Shippers or Receivers, many times these facilities do not allow them to park. AGAIN-California laws require carriers to pay drivers for waiting time and all non-driving work. ATA Argument of Patchwork of State Labor Laws– This is another absurd claim. There are other states which require drivers to be provided rest breaks. CA has the strictest requirements, therefore, if carriers comply with CA law, it will also satisfy all other state laws. 6) The ATA claims California’s rules impose an immense burden on interstate commerce as they entail an enormous loss in driver productivity by requiring carriers to provide far more off-duty time within a driver’s duty window than the Agency has deemed necessary under the federal rules. By saying that CA laws causes a loss in driver productivity, designed to promote safety, the ATA is saying that driver productivity is more important than safety. 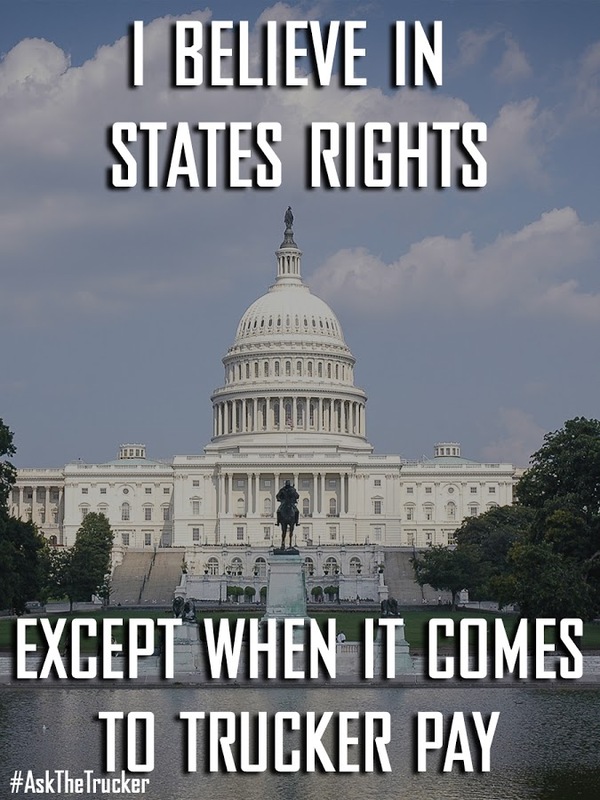 Denham Amendment claims that the true intent of Congress in 1994 FAAAA was to be able to preempt state laws such as California and other states who have similar labor laws protecting employees. Denham is written in such a way, that if passed, it would result in revised Federal law which would relieve carriers from the obligation of having to pay drivers for anything other than their piece work wages or the miles they drive. This amendment was first introduced in the 2015 FAST ACT and failed. ATA continued to reintroduce Denham to 5 other pieces of legislation and failed, including the latest FAA reauthorization bill, which also failed. ATA lost the Denham Amendment battle in Congress. Now they are going to the D.O.T to achieve the same outcome.